I'm staying true to my word from last week's post and providing you with step-by-step instructions on how to can applesauce! As I mentioned last week, I'm not an expert canner, so I don't have a lot of experience to draw from. However, applesauce may be one of the easiest goods to make and can since there are so few ingredients. So, I hope you take a chance on this very fall recipe. Step 1: Prepare the jars for canning. Before tackling this endeavor, read through the Water Bath Canning instructions. Peel, core, and quarter the apples. You may be wondering what type of apples to use. You can use any type of apple that you'd like for this recipe. I prefer a mixture of apple types, and I scored a really inexpensive bag of apples at the farmer's market since they were mostly bruised. They work equally as well for applesauce. Add the apples to a large pot and add a little bit of water (just enough to prevent the apples from sticking). Cover the pot and bring to a boil. After the water begins to boil, reduce the heat to medium-high and let the apples cook for approximately 45 to 60 minutes. The cooking time may differ depending on the types of apples used. You will know the apples are done when you can easily mash them with a potato masher. Once the apples are soften, use the masher to break down the apples into applesauce. Add 3 Tablespoons of lemon juice as well as sugar, if desired. Personally, I don't add any sugar to my applesauce. However, I saw recipes that added up to 3 cups of sugar. It's completely your preference. Keeping the mixture over low heat, transfer the applesauce to the jars per the Water Bath Canning instructions making sure to remove the air bubbles in the jars and wipe down the rims. This recipe yields 6 pint-size jars. 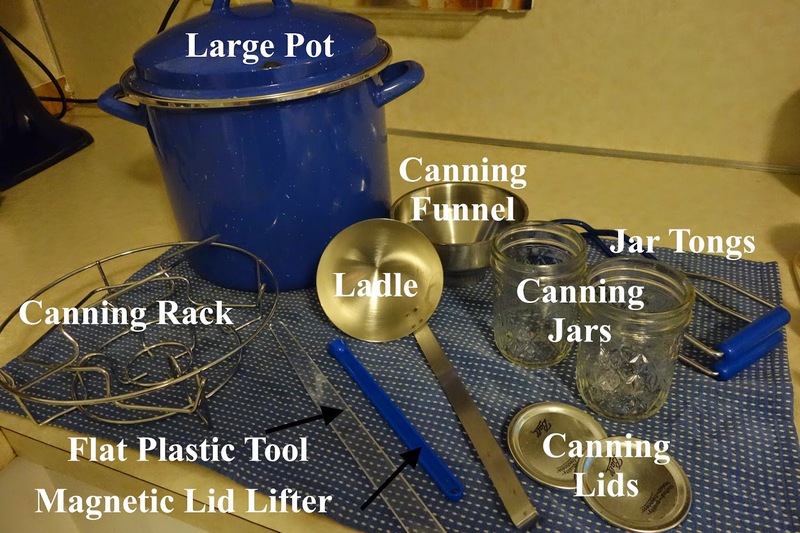 Place the lids and metal bands on the jars and process them in the water bath canning pot for 20 minutes. Allow the jars to cool on the counter for 24 hours, and then store them in a cool, dry cupboard. Enjoy up to six months later! Once you open the jar, store it in the refrigerator. What have you canned before? Let me know about your experience if you try out this recipe!